This machine has a heavy duty LANDA pump and an energy-efficient 12-volt burner to the single-piece, welded steel frame and legendary LANDA heating coil. The LANDA MHC is long-lasting. The LANDA MHC has many safety features. It meets ETL certification to the rigid UL-1776 safety standards, and sports an adjustable thermostat, rupture disk, wheel brake, 24‑inch hose guard. The LANDA MHC is an operator’s dream! It has a variable pressure wand, downstream detergent injection, quick couple nozzles. It has adjustable thermostat and a digital hour/tachometer that provides service reminders. Stability is essential for a portable washer like this. With its one-piece fully-welded 11/4-inch steel tube frame, 13-inch tubed all-terrain tires and engine vibration mounts, the LANDA MHC is rock solid. 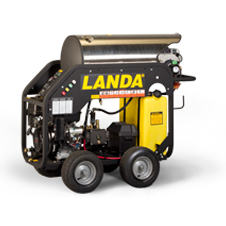 LANDA’S MHC series: the most rugged, gasoline-powered, hot water, on-site cleaning machine on wheels featuring a unique blend of quality, safety, serviceability, and extra stability. Contact PSi if you’d like to see a demonstration of this machine. Call 800-757-5222 or 714-895-6694.